The 46 metre superyacht Baglietto Fast is sold and named Lucky Me with Makis Georgakas at Marine Marketing in Greece introducing the buyer. Built in aluminium by the Italian yard to a design by Francesco Paszkowski, Lucky Me was launched in 2016. An interior by Margherita Casprini features warm shades of rosewood and white lacquered ceilings accommodating 10 guests in five cabins consisting of a main deck master suite with two double and two cabins below, all with entertainment centres, LED television screens and en suite bathroom facilities. There is also accommodation for 12 crew in six cabins. It has a low, dynamic profile, with a receding bow so that outdoor areas have been maximised to give the feeling of being close to the sea while cruising or at anchor. The bow features a swimming pool and conversation area covered by a Bimini top while the teak main deck aft accommodates a large table and a sunbathing area. Lucky Me can reach a maximum speed of 26 knots powered by twin MTU 16V 4000 M93L MTU diesel engines and her shallow draft of just 2.1 metres means that she can easily cruise in shallow waters. 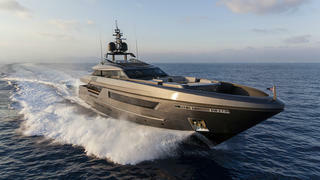 The price of the Baglietto 46m Fast has been withheld.